Ruysdael was a Dutch painter from a family of artists. He was the father of Jacob Salomonsz., the brother of Isaacksz. and the uncle of Jacob Issacksz. van Ruisdael. His real name was Salomon de Goyer but he and his brother adopted the surname of Ruysdael, taken from a castle near the family home. The name of Ruysdael’s master is not known. 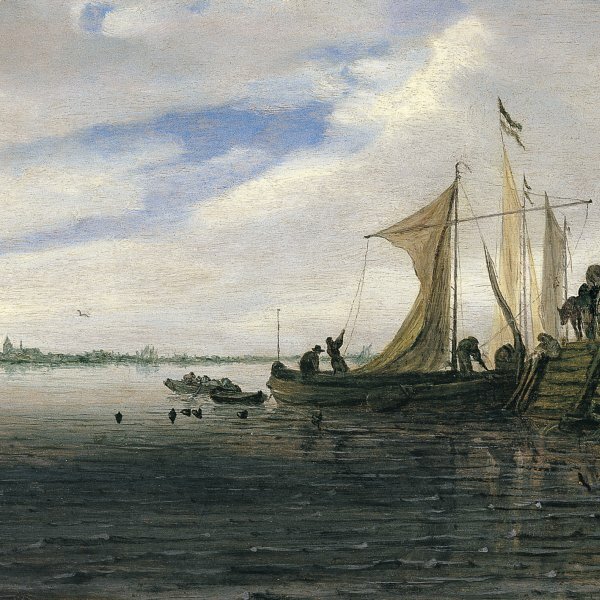 He lived and worked throughout his career in Haarlem although it is possible that he might have travelled as his subject-matter includes views of cities such as Leiden, Utrecht, Amersfoort, Arnhem, Alkmaar and Rhenen. By 1623 Ruysdael was a member of the painters’ guild in Haarlem although his first known works date from 1627, including Winter Landscape with Skiers (Kunsthistorisches Museum, Vienna). During this phase his style was notably influenced by that of Van de Velde, Hendrick Avercamp and Pieter de Molijn. His preferred themes were landscape with small figures, marine views and depictions of rivers. During the 1630s he and Van Goyen formed part of the group of so-called “tonal” painters whose paintings were characterised by a very limited chromatic range of greens, greys, yellows, browns and blues. From the mid-1640s, however, Ruysdael embarked on a new approach and introduced a greater variety of colours in more intense tones. He placed particular emphasis on clouds, which he depicted in a unique and highly individual manner. During his last years Ruysdael moved away from a naturalistic approach to landscape and imbued his scenes with a grandeur and refinement that brings them close to the Italianate painters. At this period he also executed still lifes, of which only a small number have survived.